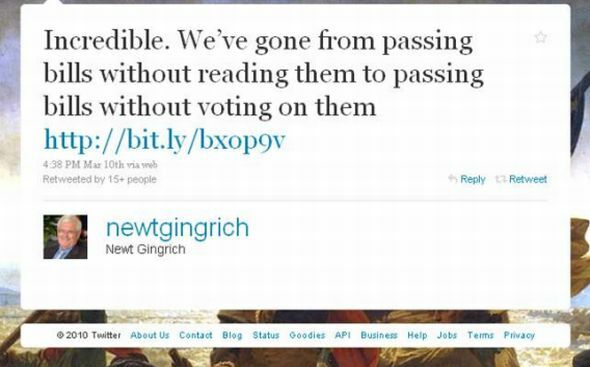 As disgraced former Speaker Newt Gingrich tweets his way into the GOP presidential race for 2012, we are reminded of his outstanding record of political and moral malfeasance in his decades-long effort to promote himself. From his personal and professional ethical transgressions to his crusade against the working class, Gingrich continues to thrive in the shadows of fiscal corruption and the spotlight of right-wing hyperbole. Despite his rocky marital past and remarkably hypocritical and extremist rhetoric, Gingrich unabashedly vaunts himself as the country's moral compass without a hint of irony, consistently waging an ideological war in an effort to maintain his own relevance. The next night, they sat talking out on their back patio in Georgia. She [Marianne] said, "How do you give that speech and do what you're doing?" "I think there is a gay and secular fascism in this country that wants to impose its will on the rest of us, is prepared to use violence, is prepared to use harassment. "I think it is prepared to use the government if it can get control of it. I think it is a very dangerous threat to anybody who believes in traditional religion. Former House speaker and possible presidential hopeful Newt Gingrich said he is going to work on slowing down the progress of gay rights, if he is elected president. "I think my emphasis would be pro-classical Christianity," Gingrich said in a video interview with Bryan Fischer of the antigay American Family Association after addressing the Rediscover God in America conference, held over the weekend in Iowa. Those Islamists and their apologists who argue for "religious toleration" are arrogantly dishonest. They ignore the fact that more than 100 mosques already exist in New York City. Meanwhile, there are no churches or synagogues in all of Saudi Arabia. In fact no Christian or Jew can even enter Mecca. In the words of former speaker of the House Newt Gingrich at a July speech at the American Enterprise Institute, "stealth jihad" is an effort "to replace Western civilization with a radical imposition of Sharia." Gingrich, who has been intimately involved in District affairs, also was asked to respond to the suspicions of some residents that Republican interest in the city is part of a "conspiracy to boot out the black-run government" and "roust out" poor blacks. Referring to former Justice Sandra Day O'Connor's saying that "a wise old man and wise old woman will reach the same conclusion in deciding cases," [Sonia] Sotomayor said, "I would hope that a wise Latina woman with the richness of her experiences would more often than not reach a better conclusion than a white male who hasn't lived that life." Gingrich says that D'Souza has made a "stunning insight" into Obama's behavior - the "most profound insight I have read in the last six years about Barack Obama." VIEIRA: Can you honestly compare what's going on with the Democrats with Nazi Germany? GINGRICH: No it's not a question of how evil they were. Nazi Germany was terrible, Stalin's Russia was terrible, Mao's China was terrible. It's a question of finality. Had we lost either of those contests, we would have become a radically different country. WALLACE: So - but you compare that to the Nazis and the Communists? GINGRICH: Well, you know, I carry around a bumper sticker that says 2 plus 2 equals 4. So I'd be very curious how a dollar given to somebody becomes a $1.79. And I think if we could get that to work with the U.S. Treasuries, so if people gave the Treasury $1,000, it became $1,790, we could pay off the federal debt and never worry about spending or anything. I mean, I - you know, somehow, I don't understand how liberal math turns $1 into $1.79. decay, failure (fail) collapse(ing) deeper, crisis, urgent(cy), destructive, destroy, sick, pathetic, lie, liberal, they/them, unionized bureaucracy, "compassion" is not enough, betray, consequences, limit(s), shallow, traitors, sensationalists, endanger, coercion, hypocricy, radical, threaten, devour, waste, corruption, incompetent, permissive attitude, destructive, impose, self-serving, greed, ideological, insecure, anti-(issue): flag, family, child, jobs; pessimistic, excuses, intolerant, stagnation, welfare, corrupt, selfish, insensitive, status quo, mandate(s) taxes, spend (ing) shame, disgrace, punish (poor...) bizarre, cynicism, cheat, steal, abuse of power, machine, bosses, obsolete, criminal rights, red tape, patronage. Gingrich made the final payment of $150,000, the committee said, and "has now satisfied in full" the obligation imposed in January 1997. The outgoing speaker originally arranged a loan from ex-Sen. Bob Dole to help with the payments but decided instead to handle the penalty from personal funds. Having been formally reprimanded by the House in 1997 for violations associated with the political use of tax-exempt organizations -- which were structured similarly to the new center -- Gingrich decided that a nonprofit would have invited enormous scrutiny. Organizing as a for-profit company, however, permits him to operate "under the radar," Tyler said. Gingrich on Neil Cavuto, 9/17/04: "You can't flip-flop and be commander-in-chief." Gingrich on Hannity & Colmes 9/27/04: "I think Kerry's problem is one of identity... He can't quite decide, you know - and so I think what you're going to see more likely with him is a kind of schizophrenia. And if the moderator's at all serious with Kerry, and puts Kerry on the spot as saying, now, you said a, and you said b. Which is it? I think Kerry's got a big problem." February 22: Gingrich blasts Obama for being "quiet" on Libya, says administration "ought to be firmly on the side of the Libyan people in replacing this administration." February 24: Gingrich again attacks Obama for being "strangely quiet" about Libya, claiming that if Obama is more vocal on Libya, its military will bring about regime change on its own. March 7: Gingrich criticizes Obama for not using military force in Libya, says that the United States should unilaterally "exercise a no-fly zone this evening." Gingrich says ground forces are unnecessary. March 23: Shortly after Obama exercises a no-fly zone in Libya, Gingrich criticizes the President for doing so. Gingrich says, "I would not have intervened." March 23: On Facebook, Gingrich criticizes Obama for being vocal about his desire to replace Gadhafi on March 3. Say he now supports the no-fly zone because of Obama's March 3 statement. In 1994, just a few days before the midterm elections, a deranged woman named Susan Smith drowned her two young sons. Gingrich, at the time, made infanticide a campaign issue and publicly equated Smith's murders with the values of the Democratic Party. Gingrich told the AP, "The mother killing her two children in South Carolina vividly reminds every American how sick the society is getting and how much we have to have change. I think people want to change and the only way you get change is to vote Republican." Gingrich Criticized The Self-Executing Rule. In a post on Twitter, Gingrich wrote: "Incredible. We've gone from passing bills without reading them to passing bills without voting on them." Gundersen Lutheran Health System in La Crosse, Wisconsin has developed a successful end-of-life, best practice that combines: 1) community-wide advance care planning, where 90 percent of patients have advance directives; 2) hospice and palliative care; and 3) coordination of services through an electronic medical record. The Gundersen approach empowers patients and families to control and direct their care.